Introducing the new chocovison min rev chocolate tempering machine!! Same great features as the Rev1, new LOWER price!! NOW ONLY $379.00 WITH FREE US SHIPPING!! ChocoVision's newest tabletop chocolate tempering machine is designed with the homemaker and hobbyist in mind. 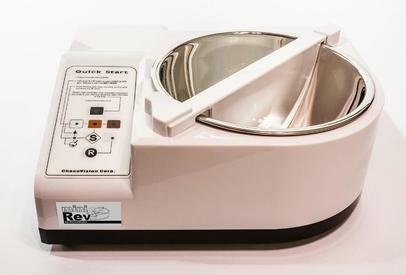 The Mini Rev possesses all the technology to create perfectly tempered chocolates, while maintaining simplified features that anyone can follow. Create perfectly tempered dark, white, or milk chocolate in just twenty-five minutes. Whether having fun with the family on the holidays or adding a special touch to a dinner party, the Mini Rev is an affordable appliance for any chocolate lover!